The tough-as-nails logging shirts of the Pacific Northwest inspired the rugged construction of the Carhartt Hickory Stripe Shirt. The Hickory shirt from Carhartt, was of a heavier material and tends to last longer. These were the only ones our family purchased.AS a logging/trucking, mill worker family, you had 3 customers here!! Highly recommend all/any of your product. That is all I have worn for many years, coats, vests, shirts, pants and suspenders. Total comfort is the reason. I much prefer the button up front and wound up on your site because I couldn't find them anyplace and was same with your site so took the zipper. What's the deal with the button fronts or am I just missing the obvious and could have gotten them?? Thank you for asking. This shirt washes up nicely and is very comfortable. The material is wonderful and the shirt is well made. Great purchase! the sleeves are slightly small and that is my only complaint. We purchased 30 of these shirts for our construction crew. They look much different in person. The guys relate them to a train conductor look. The fabric isn't flexible and they are hard to get in and out of. 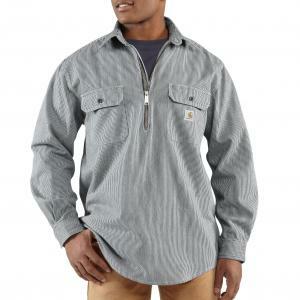 Other than that, the fabric was very durable and the construction quality is true to Carhartt's high standards. If the lines were more faded, it wouldn't be as shockingly railroad style. Sleeves are still too short, even when buying a "Tall". I bought an extra large "tall". The sleeves are still at least 2 inches too short for my arms. That being said, I love the heavy fabric and the construction quality is good. I hate that it is imported from China. You can do better Carhartt! This is one incredible shirt. Unusually well made, out of heavy-weight (“railroad engineer hat”) material. Fit: My arms/ shoulders are a bit oversized for a medium (from swimming and lifting) but unlike so many mediums, this shirt has room--- for me and a long sleeve thermal come winter. My one disappointment is cosmetic: the zipper is oddly about two or three inches too long. Zipped up, it looks like I’m wearing a western lariat tie. I have four zip-up sweaters which I measured. Much shorter and much less visible zippers. (To be fair, it is one heck of a zipper that looks like it will be around longer than me!) All-in-all-- GREAT shirt. Buy one for yourself. I work in the Power Industry so I am out in it sunny, rain, snow and wind. As others have said this is great as a top layer for shirts when it's in the teens or as a layer over a cool shirt when the temps rise in the spring. Loose enough to let you move but not so lose it hangs you up in tooling or pipe racks.